With Readly you can read SFX Annual and thousands of other magazines on your tablet and smartphone. Get access to all with just one subscription. New releases and back issues – all included. 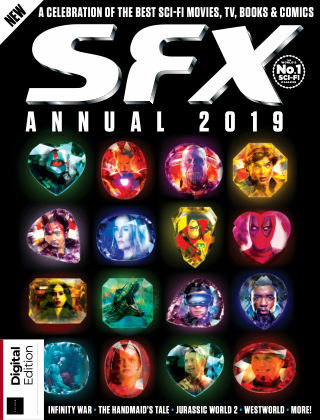 Welcome to the 2019 SFX Annual, packed full of the very best movies, TV shows, books and comics that have made 2018 one of the most exciting years for sci-fi and fantasy ever. We have witnessed things you people wouldn't believe: half the Marvel Cinematic Universe disappear in a cloud of dust in Avengers: Infinity War; dinosaurs roaming the Earth once more in Jurassic World: Fallen Kingdom; Offred continuing to survive in the nightmarish world of The Handmaid's Tale; humanity edging closer to its reckoning in season two of Westworld, and much, much more. All of these moments – and much more – have been preserved in this annual celebration of the most exciting genre in the universe. Time to buy.